Drinking beer and making merry was all well and good, but for it to be sustainable mankind had to find a way of keeping track of what was being consumed and traded. Enter beer’s second great contribution to human history: record keeping. As agriculture became increasingly geared towards beer production, beer became the most important form of food and payment in ancient Egypt. In fact, the workers that built Egypt’s famous pyramids were paid in beer. Everyone drank beer in ancient Egypt – men, women, even children! Some of the oldest surviving forms of writing are records kept in stone – bookkeeping records kept by those in charge of the brewing process, who inscribed notes to track when brews were started and when they were ready to drink. 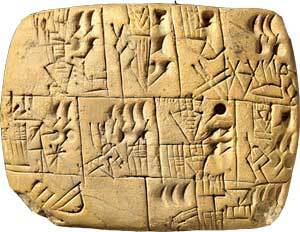 In fact, over 160 different characters were found in ancient texts to represent beer. That’s more words than the Eskimos have for snow! The first mixing equations; calculating how much water was needed to ferment barley; how long it would take for beer to ferment without spoiling. These calculations, and others, helped mankind down the path of mathematical discovery. By the 3rd century BC, civilisation was in full swing thanks to this magical brew.